GHPUG Quarterly Meeting - June 16, 12-3 PM - RSVP Here! Hello Houston PTC folks, we are excited to announce our quarterly meeting! 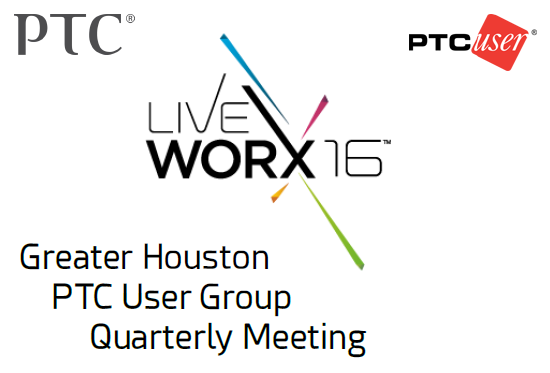 Meet other PTC users, get a LiveWorx 16 recap, and learn more about Creo 4. Lunch will be provided for those that RSVP here. We will be posting more information as we get closer to the event. See you there! Re: GHPUG Quarterly Meeting - June 16, 12-3 PM - RSVP Here! We would like to thank Barry-Wehmiller International for their generous sponsorship and help in getting this event organized. Hey everyone, I've updated the agenda to include an intro to Creo 4. Also, you can also register for the event here, or RSVP directly to me through the PTC User Community mail system, or directly to my email at geoff@baxsaa.com.